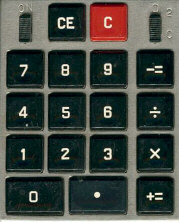 Texas Instruments developed already in 1960 the Klixon™ hermetic miniature and sub-miniature snap action switches known from a lot of early portable electronic calculators. These Precision Hermetic Switches have been used in the past 40 years in a wide range of applications, and can be found even in the Space Shuttle. Today the TI facility in Attleboro, Massachusets manufactures Precision Thermostats, Thermal Circuit Breakers, Aircraft Circuit Breakers, Airflow Sensors, and Temperatur Stabilizers. 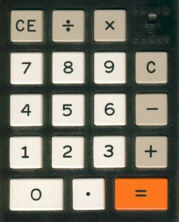 These key-technologies of a portable electronic calculator were introduced one after the other in 1970 to 1971 and supplied to other manufacturers. 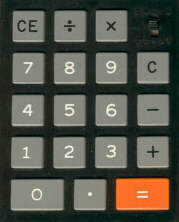 The Klixon™ keyboard and the TIL-360 LED-display modules were perfectly designed to match with the TMS0100 MOS/LSI single-chip-calculator circuit. 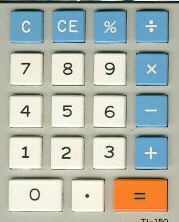 The first usage of the Klixon™ keyboard in combination with the TMS0100 was the Bowmar 901B pocket calculator. 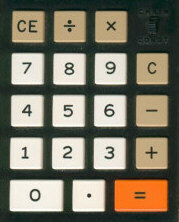 A lot of other brands followed and even combinations with odd calculator circuits appeared, e.g. the Litronix Checkmate 1002. This story describes the unique Klixon™ keyboard and gives both an overview of the known keyboard variations and the calculators making use of them. The "Basic 1KS" keyboard array with the gold disc panel mounted on a printed circuit board with the interconnections of the keys to the external calculator circuit. The snap-action Klixon disc gives the positive tactile feedback and promised an ever lasting function due to the gold-surface and the Mylar sealed protection against dust and other environmental conditions. The flat construction of the keyboard array made an overall thickness of just 0.15" possible. The "Complete 6KS" keyboard assembly added to the printed circuit board with the disc panel a stainless steel mounting frame and the molded keytops. The double-shot molded keytops provides a valuable feel and appearance and allowed a lot of flexibilty for customer specific design. 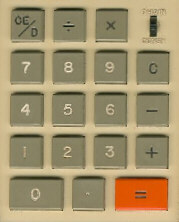 Nevertheless most electronic portable calculators used an identical format without variations of key spacing, number of keys, and even color of the keys. 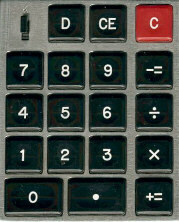 In addition to the 4 function keys [:], [x], [-=] and [+=] a variation with 5 keys appeared: [:], [x], [-], [+] and [=]. 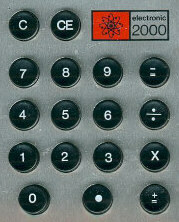 The TMS0120 developed for the SR-10 calculator supported a matrix of 6 rows by 4 columns. 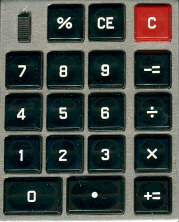 The TMS0128 used in the JCE Percent calculator supported a [%] key. 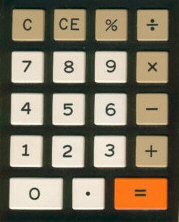 In December, 1972 the Klixon™ keyboard was used by more pocket calculator manufacturers than other type (December 18, 1972 issue of Electronics). With a lot of calculators it is obvious that they make use of the „Complete 6KS“ keyboard assembly, but even cheap looking keyboards (e.g. the Exactra 21) rely on a customized 1KS keyboard array. The following table will concentrate only on the early form of the Klixon™ keyboard introduced with the Bowmar 901B and buried with the Datamath II. 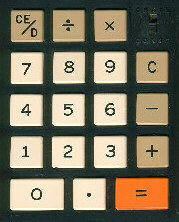 Already in 1974 the first copies of the Klixon™ keyboard appeared on the market. Don't miss the Bowmar MX55. The revival of the snap disc? BA II PLUS Professional in 2004. © Joerg Woerner October 21, 2002. No reprints without written permission.